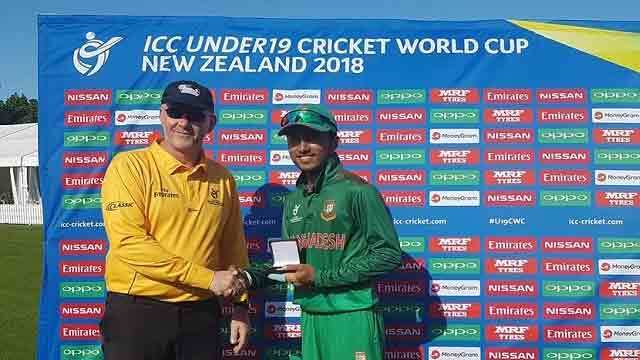 Dhaka, Jan 15 (Just News): Bangladesh reached the quarter final of ICC Under-19 Cricket World Cup beating Canada by 66 runs at Bert Sutcliffe Oval, Lincoln, New Zealand on Monday. Sent into bat first, Bangladesh under-19 team scored 264 for 8 in the stipulated 50 overs featuring a century by Towhid Hridoy (122) and a half century by Afif Hossain (50). In reply, Canada were all out for 198 runs in 49.3 overs. Afif Hossain, who hit a half century, also grabbed five wickets for 43 runs and was adjusted man of the match.